Osmos Cloud is a hybrid CRM solution designed for small businesses. It integrates Customer Relationship Management (CRM) and Business Intelligence (BI) within Enterprise Resource Planning (ERP) software. It allows businesses the freedom to work from anywhere without sacrificing productivity or business control. Osmos enables businesses to effectively manage clients and leads, send quotes and invoices, produce requisitions, register accounts payable and receivable, track inventory, and review business reports. Businesses can conduct every operation needed to succeed. Businesses can choose the modules they need, whether that be just a CRM solution, or also a solution that can send estimates and invoices or track accounting and inventory as well. All business information can be accessed anytime and anywhere there is an internet connection. Everything is synced to the cloud, so real-time business information is available on any laptop, tablet, or mobile device. Osmos Cloud allows businesses to easily assign roles to users, and give credentials to supervisors and managers at different levels of responsibility. It also lets businesses keep track of business processes, reducing errors and increasing efficiency. Users can be added and deleted quickly and easily. All modules of Osmos Cloud are fully automated and ready to use. Included are a customer master and vendor manager module, a quotations and estimates module, contracts and invoices module, accounts payable module, orders module, requisitions module, purchase orders module, a stock and inventory module, the customer relationship (CRM) module, and a report and accounting/business intelligence module. Osmos Cloud offers interactive functionality that lets clients accept, e-sign, pay, reject, or give comments right from your proposals. Also included is the functionality to connect and link email via IMAP and SMTP, send, receive, reply, and create email templates directly in Osmos Cloud. 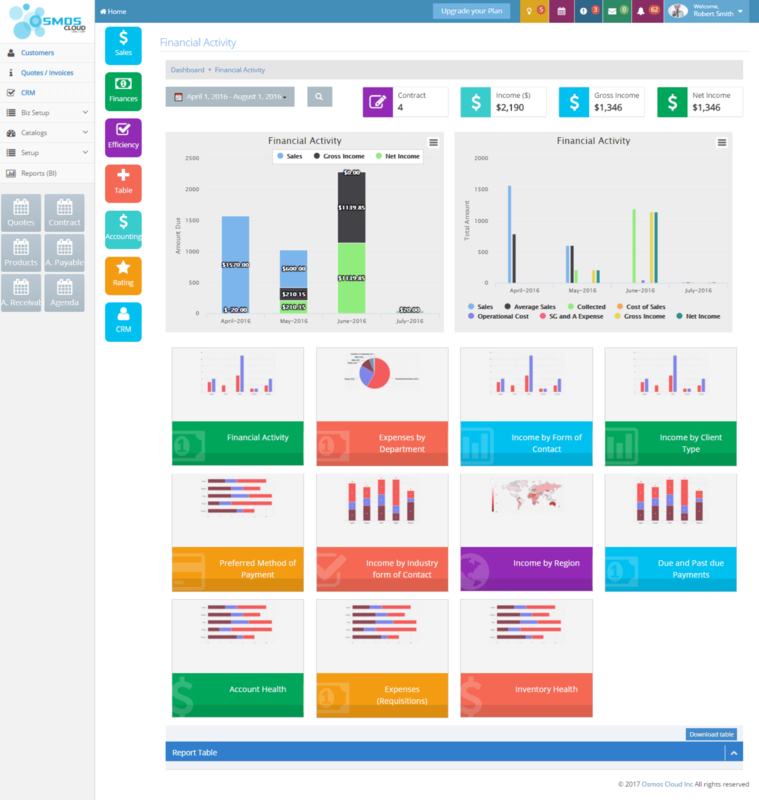 Still not sure Osmos Cloud Hybrid CRM is right for you? Use our Product Selection Tool to compare other CRM software solutions. Have questions? Call one of our unbiased Technology Advisors for a free consultation. Learn everything you need to know about Osmos Cloud Hybrid CRM. Our experts will reach out to you shortly.